Met with the RE folks yesterday. Took condo off of market for few months. Let thing settle a bit. Probably back on market in the spring. Still trying for rental. Put the patio furniture and grill away. Assuming that no rental, then we have to have the patio stuff in for winter. Took down “Bowker Party Deck” sign. Dry cleaners SNAFU’d yesterday. Clothes not ready due to boiler failure. So now we have to go to Laconia to try and find the stuff. Closed out PO box. Got refund, didn’t expect that. So got to go up the hill to dumpster with the trash then start loading. It’s a beautiful day in sunny NH. Not too hot yet. We are on schedule to depart MA on Thursday. A lot has to happen before then. I called PODS.COM to schedule the transport of our POD to LA. Done. It will be there before us. More packing and loading of the car today. We hope to be mostly loaded by the end of today. That being said a few errands need to be done. Got to go to USPO to forward mail to San Pedro. Pick up dry cleaning and finally meet with R.E. agents on plans to sell and/or rent the condo. We’re kind of assuming that it won’t rent or sell. So we need to make sure that the place is ready for winter. Wind up the awning, put away the deck furniture, etc. I replaced the 9v battery in the freeze alarm. (device that auto-magically calls me when temp goes below 42F). Tomorrow we had to Chelmsford to stay with friends. Probably dinner at Kimballs in Westford. Past Masters’ dinner on Wednesday evening. During our trip to Ireland, we toured the countryside in Connemara. 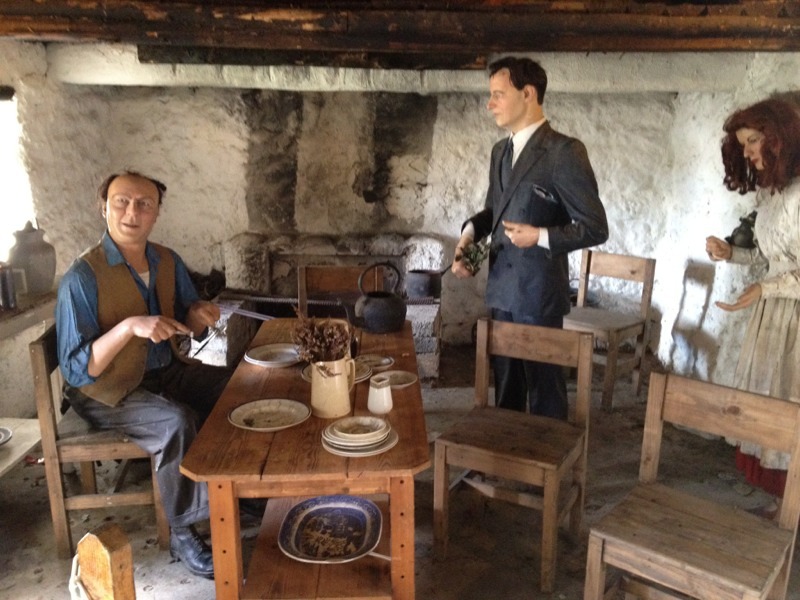 During that particular trip the tour guide talked about the filming of the movie “The Quiet Man”. “The Quiet Man” starred John Wayne, Maureen O’Hara, and Barry Fitzgerald. 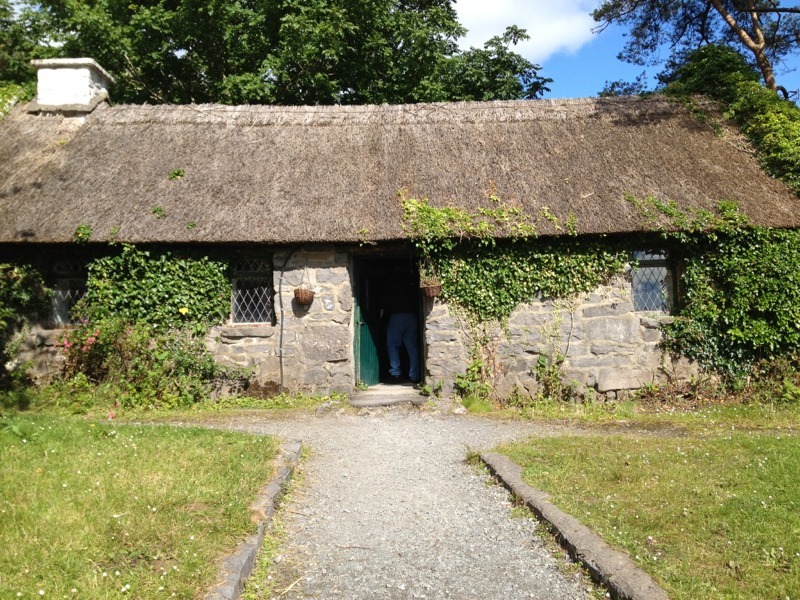 The tour even stopped at a replica of the Irish cottage so that we could take pictures. So we decided to get a copy of the movie from Netflix and we watched it last night. The plot revolves around Sean Thornton (John Wayne) returns to the place of his birth from America where he was a prize fighter. Sean meets Mary Kate Danaher (Maureen O’Hare) and promptly falls in love. Hilarity ensues. The movie was directed by John Ford. It has been said that this movie is the Irish version of “The Taming of the Shrew”. The cinematography was outstanding. I can only imagine what this movie would have looked like on the big screen. The movie brought back to us all of the beautiful Irish countryside. We thoroughly enjoyed the film. Here’s the URL for the IMDB entry. So, a few days ago Paula and I were sitting in a pub enjoying a pint of Guinness. 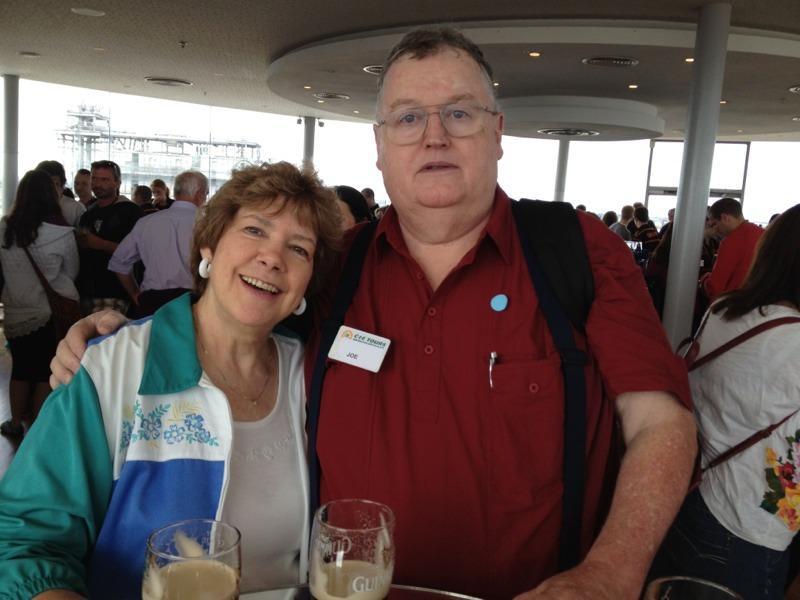 She says to me, “Are there any Irish pubs in San Pedro?”. I don’t know I say. Lets ask the nice folks at Google. 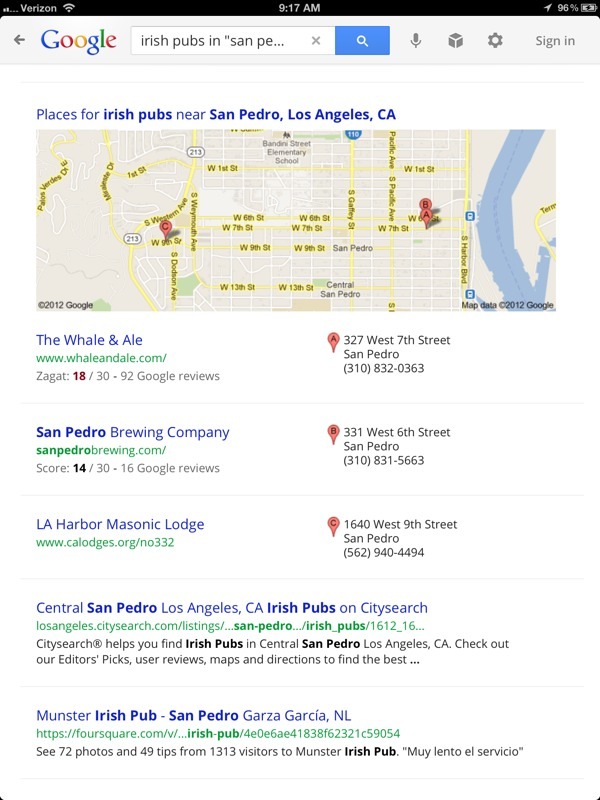 Yes indeed there are Irish pubs in San Pedro. But take a look at the screen shot from the Google app. Third entry down the page is “LA Harbor Masonic Lodge”. Excellent. I’m impressed. Note: For all my East Coast friends, LA Harbor Lodge is the lodge that my sons belong to. Guess I will get going on my affiliation application ASAP. We stayed in a total of 5 different hotels on our tour. All of them classed as “Superior First Class”. The hotels were clean and well kept up. All of the hotels used a key card for entry. And in some of them the key card was used to turn on the electricity in the room. One of hotels required a key card to use the elevator (or lift as the Brits would call them). We had requested double beds. Sometimes we ended up with twin beds. Don’t even think about asking for a King Size bed. The two hotels in Dublin had AC, the others didn’t. But you really didn’t need AC. In fact, bring a light jacket. A couple of hotels had a fire going in the lobby. Looked like they were burning peat. We were surprised at the use of peat as a fuel. All of the hotels had WiFi. One of the hotels charged a daily fee. internet performance was a bit hit or miss. You will need to bring plug adapters. The Apple chargers will run on 120-220v, so all you need is the adapter. When in doubt, read the adapter label. If it says “Input Voltage 110-220” then you’re okay. The adapter is the same type as used in the UK. Some of the tourist sites had free WiFi, though performance was a bit spotty. Don’t forget to put your iPhone into “Airplane Mode”. Otherwise you will have a big surprise when you get the bill. Food. Each hotel had a pretty much standard UK breakfast buffet. As is typical of the Brits, the fried eggs were overcooked and the scrambled eggs were undercooked. Irish bacon is much like Canadian bacon. They usually had a variety of cold cereals. Typically, there was a collection of breads. Coffee was from bad to absolutely terrible. The Irish have no clue on how to brew a decent cup of coffee. Dinner. The dinners were a three course affair including starter, main course and dessert. The Irish have seem to have a habit of serving a piece of meat on top of a bed of mashed potatoes. Always served with some sort of gravy. Desserts were generally very good. The lamb and pork was good. The beef was not so good. The word “Rare” is not in their vocabulary. Bar service. A shot of Jameson’s and a pint of Guinness is your best choice. Ask for ice if you want it. Don’t assume. Don’t even think about ordering a Mai-Tai or Martini. Did I tell you that I’m going through Guinness withdrawal? Ice machines? That’s crazy talk. Bathrooms. Irish bathrooms have broken one of the cardinal rules of plumbing. ie. hot water goes on the left. Some times it was a bit of a challenge to figure out the shower controls. Paula’s biggest complaint was a lack of wash cloths. The tubs also were about an inch or more higher. Made for challenges getting into the shower. All of the rooms had hair dryers. But for some change reason, they were stored in one of the dresser drawers. Weird. All in all, we had a great time. CIE Tours did a great job. Now we need a few days to recover. Time to write down a few things about our tour. We had a wonderful time. The tour was run by CIE Tours. We really can’t enough good things about them. The tour was the “Irish Explorer” tour that was 10 days long. If we were to do it again we might have picked a slightly shorter trip. After 10 days on the road we were worn out. There is little time to sit around and do nothing. We were up by 0600 every day and on the road by 0800. Typically we would get back to the hotel around 1700. Here is the URL for the tour. Our tour director was Patrick and he was a walking encyclopedia on things Ireland. And he could maneuver that bus into some unbelievable places. CIE runs fully inclusive tours. This means everything is covered with the exception of lunches, bar bill, and gratuities. We changed hotels every day. So that meant that on the day you were changing hotels, we had to have our luggage outside the door at 0700. So we didn’t have to schlep the luggage around. i will write a separate post on the hotels. We visited some places that we had never heard of before. We had a total of 29 people on our group. It turned out to be a really fun group. We really enjoyed the group. We had people from New England, New York, Ohio, Minnesota and Florida. About half the group were retired. and the other half in 40’s/50’s. Weather was cool. Most days the high temp didn’t get above 65F. Somedays we had a little rain. Most of the rain seemed to burn off by afternoon. We flew on Aer Lingus. We were surprised to get free meals in coach. And no charge for baggage. Outbound trip was on the red-eye. By the time we got to our hotel we were pretty well ragged after the 6 hr flight, customs, luggage, etc. If were to do visit Ireland again, we might stay in one place for a longer time. There was so much in Dublin that we just didn’t have time to see. We are sitting at gate 414 at Dublin Airport. We have said our goodbyes to all of our tour mates. So now it’s just time to wait for the boarding call. It’s been a grueling 10 days, but we had a lot of fun. We a really good group from all over the place. Total of 29 people on the bus. We were up early and out late. I will post more pictures when we get home.